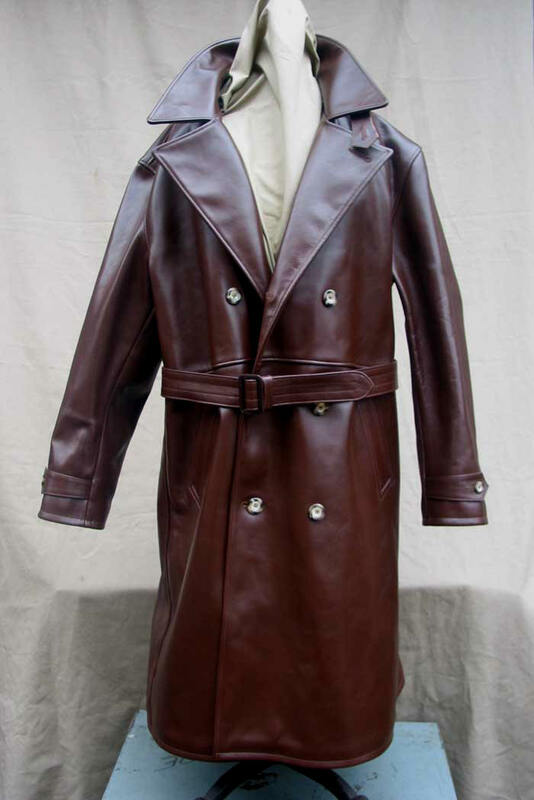 This magnificent Russet Horsehide Trench Coat is a slavishly-accurate copy of a very scarce pre-WWII Army coat in our Collection. In fact in our years of collecting the only such example we've come across. A very heavy piece of outerwear in 3.0 - 4.0+ oz. 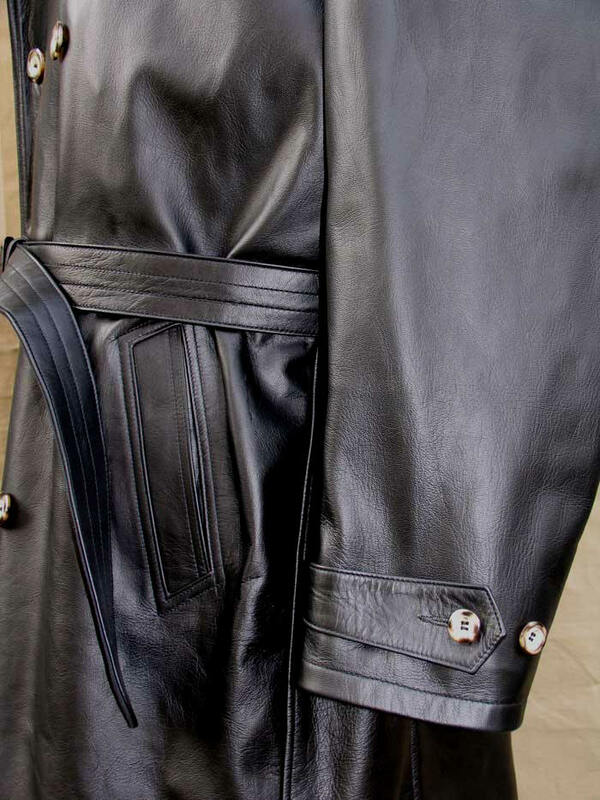 (customer preference) chrome-tanned Russet Horsehide. 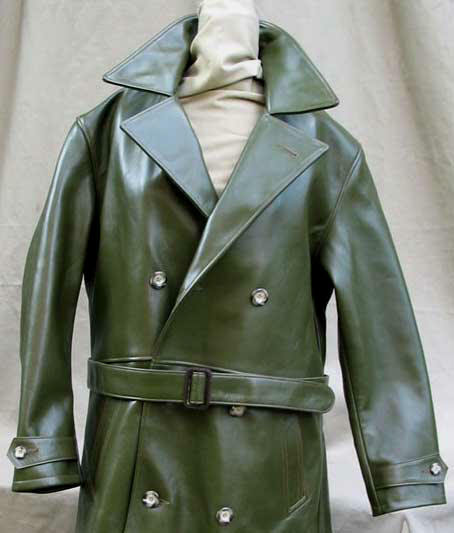 This Coat was a fully Custom Order, and is available as such for the adventurous individual. 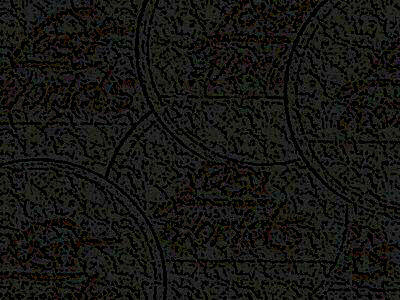 We include it here principally to show what LOST WORLDS has done and can do for the customer who requires (and knows the value of) a non-production item. Certainly it's not cheap to do something like this, which required its own pattern, to start, and days for production. Yet, for those amazed at the ridiculous prices that "designers" charge for their "creations," the lion's share of your buck going for the marketing, the label, not the clothing, LOST WORLDS Custom Orders are, dare we say, cheap at the price. Because they are the best of their kind in the world, heirlooms and pricey "collectables" (ugh) in their own right in years to come. 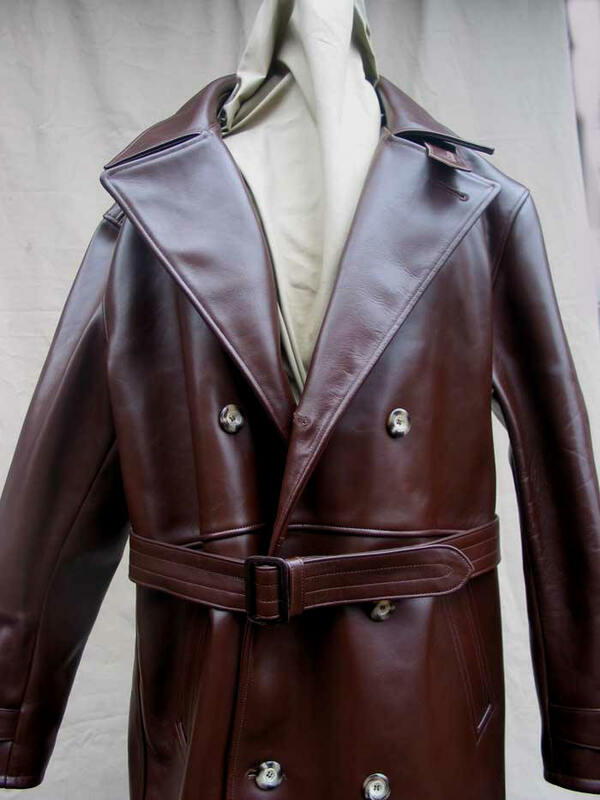 The customer who ordered this already owns a large and unique sampling of LOST WORLDS jackets and coats in many custom hides and styles, including deerskin, elk hide, horsehide, Ventile, cowhide, USAF flame retardant Sage Sateen, etc. He wanted a coat to exceed the very best of the sought-after vintage types on eBay and the like. We made it for him. 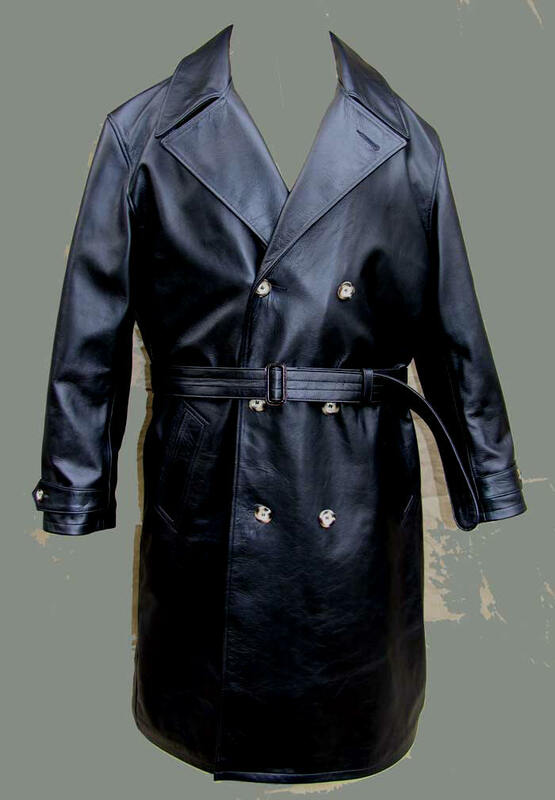 "I have received my trench coat. 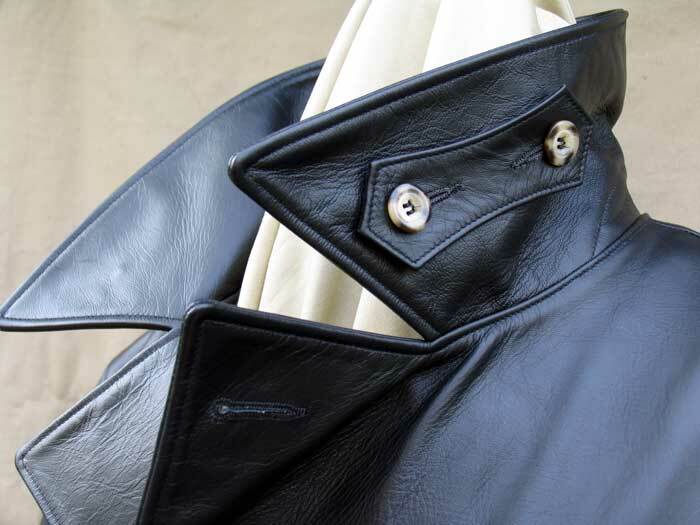 It is really gorgeous!At the first glance, I am deeply impressed by the top quality horsehide leather, and the coat as a whole looks extremely strong. 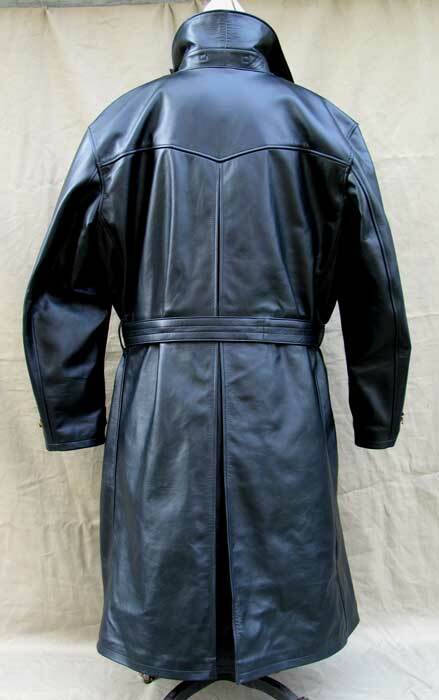 For me, I am always fascinated by this kind of heavy-weight leather coat. This trench coat is exactly what I want! It is really a work of art. I tried it on, and the size is also perfect. I can wear a sweater beneath it in winter, or just a shirt beneath it during warmer days. For the craftsmanship, it is top notch! I am pleased with every detail. Thank you very much for the help all the time."